evangelizing the (digital) natives : How Do You Define a "Calculator"? As our technology shifts from being based on hardware (music player, camera, "computer," telephone, datebook, notebook) to based around software (all of those things living on your smartphone or tablet), we've also seen a shift in the tech capacity of our classrooms. Humor me for a moment and tell me this - which of the following are "calculators?" Did I surprise you with any of those choices? 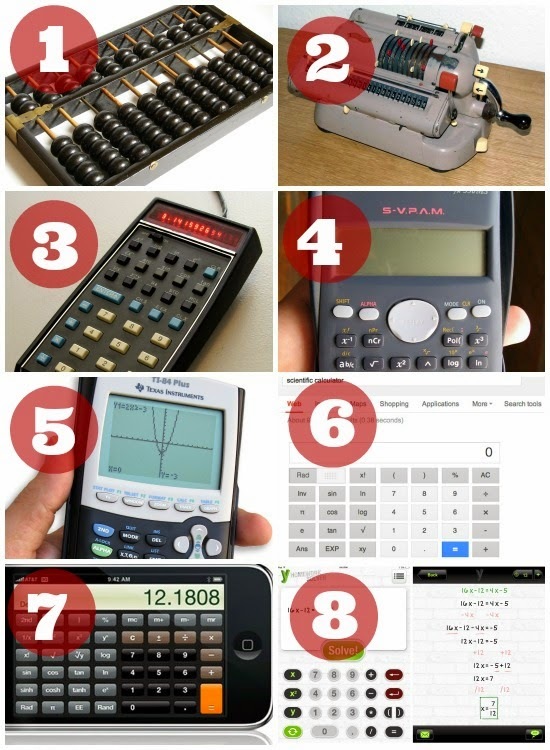 There is probably some debate between #6-8, and the thought of 1 and 2 being very useful to you might be amusing, but my point is that what we call "calculator" has evolved to match the power of our technology. Most everyone I teach with grew up with access to a graphing calculator (even if it was a TI-81), so its quite natural to have your students use it in the same way, but there was a lot of debate in the 80s about whether or not kids should be using calculators, and then again in the 90s about kids using graphing calculators. To me, the next phase in this discussion is the use of physical calculators with algebra solvers or apps like PhotoMath (which I wrote about here) or HomeworkSolver (picture above as #8). 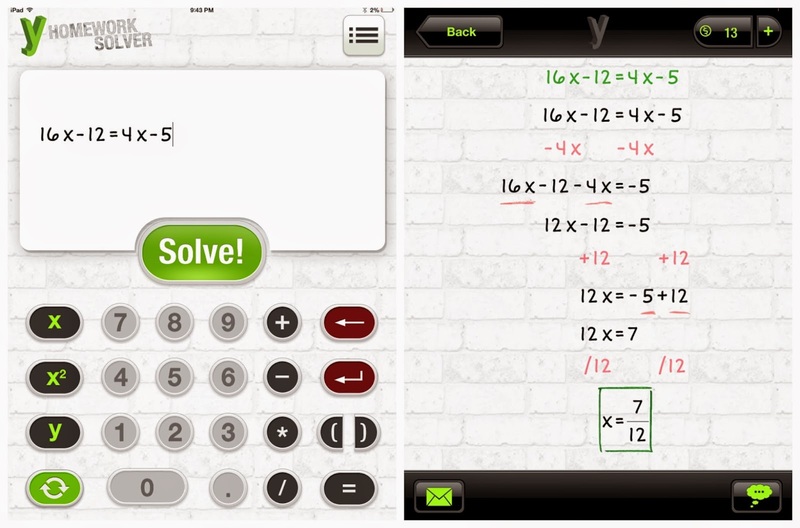 Similar to how students hover over the problem with their device's camera in PhotoMath and identical to how a student would use Wolfram Alpha, students enter the equation to be solved and what is returned to them is a step-by-step solution that gives them the value of the variable. I found a kid using this app a couple of weeks ago while he was working on practice solving some level of inequalities. The discussion went something like this after he came to show me all of his answers. "Cool. Next time, do that all by yourself." "What do you mean? I did do this!" "Nah, man. I watched you over their on your phone looking at the answers." "This is just a calculator!" "No, calculators just do things like 9*6=54"
I was kind of stuck. He was right. I finished with what I feel like is a cop-out answer: "Well, you can't use that in here." That's fine that I set that rule for class, and I am responsible for making sure this kid can solve an equation in Algebra 1, but it ignores the real debate. What constitutes a "legal" calculator in your classroom? Let's frame it in the context of our real job - which calculator best prepares our students for the "real-world" ahead of them? If I'm answering that question for myself, the least I get to is to allow graphing calculators at all times, and I'm still on the fence about algebraic calculators. We need to change what we ask of kids in our curriculum, because we can't erase the technology.